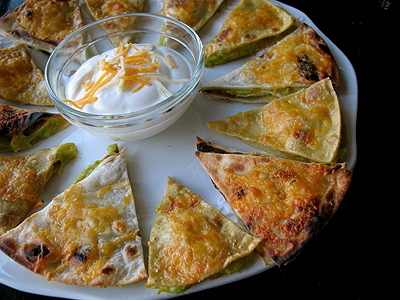 Quesados are soft flour tortillas that are stuffed with cheese and served with sour cream and guacamole. 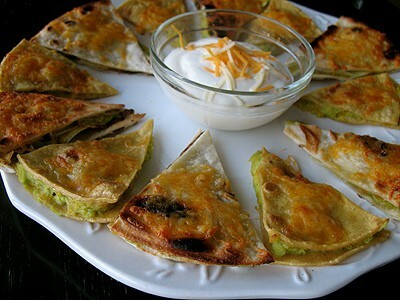 When you are serving quesados to a large group of people however, double dipping in the sour cream and guacamole dishes could be an issue. Instead, I’ve mixed the sour cream, guacamole and the cheese and stuffed them to make perfectly tender crisp little sandwiches. Place a dish of sour cream on the plate with a spoon so that guests can spoon out a portion for themselves on their appetizer plate. This appetizer recipe is part of my Mexican holiday menu that I submitted to the Breakstone’s Sour Cream Blogger Challenge. I have some tough competition, so I hope you’ll vote for my menu when the challenge opens on November 15th! Meanwhile, these quesados are a must try. They are a very easy appetizer to make, they taste marvelous (you can’t eat just one!) and would be ideal for game day too. No one wants to spend all of their time in the kitchen at the holidays, even a dedicated foodie! Keeping some of your dishes simple will allow you the opportunity to spend time with friends and family. You can use any cheese you like and even substitute prepared guacamole to save you some time. While you can certainly use corn tortillas for this appetizer, flour is softer and works better. Incidentally, I used Tortilla Land fresh tortillas. To prepare their tortillas you simply steam them or cook them in a dry skillet for 30 seconds each side. Delicious! Use your favorite flour tortillas, just be sure to warm them a bit before starting. Note: If you happen to taste test the filling mixture before the appetizer is complete, don’t be alarmed at the salty taste. The finished quesados are not too salty and come out perfect. Try my Shredded Chicken and Chile Enchiladas and for dessert, Mexican Chocolate Sour Cream Cupcakes with Dulce De Leche Frosting! Prepare tortilla by warming them in a dry, hot skillet or by steaming them. Keep tortillas warm. Place avocado, onion, lemon juice, salt and garlic powder in food processor. Process until smooth. 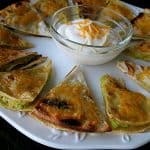 In a large bowl, mix together the avocado mixture, 1/2 cup Pepper Jack cheese, sour cream, and 1/2 cup Colby Jack cheese. Spread avocado mixture on one side of 3 of the flour tortillas. Top with remaining tortillas and press down gently. Preheat broiler and using a pizza cutter, cut each tortilla into 8 triangles. Place on large cookie sheet and sprinkle with remaining 1/2 cup of Colby Jack cheese. Broil about 3 minutes until cheese is just melted. 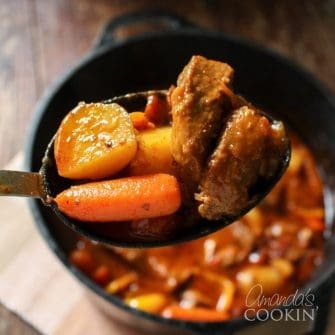 Serve with sour cream or taco sauce. Corn tortillas can also be used. my goodness Amanda I'll be making these little guys over the weekend!! With Mexican food you can never go wrong. Keep up the good work. I love that idea that Enrique shared too.